The Stormwarden's children have been kidnapped and Garrett, P.I. is on the case. But caught between the bewitching beauty of a half-elf and the fearsome power of a horde of ogres, Garrett has to think twice before sacrificing all for a fortune in gold-after all, even in this enchanted land, he's only human. Not as bad as Sweet Silver Blues but still with many sigh-worthy moments. I think the titles are the best thing about this series. http://pagefault.booklikes.com bookaneer 3.5 "A good-looking gal turns on the tears and Garrett is a knight ready to tilt with dragons." 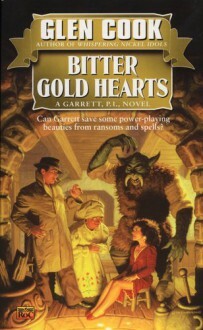 text "A good-looking gal turns on the tears and Garrett is a knight ready to tilt with dragons." Although the story itself was resolved, the resolution was kind of a lose-lose situation for almost everyone. I am not a person who needs happy endings by any means, but it seems like something could have resolved well....At any rate I do plan to continue with this series.